Dr Audrey Kinahan, pictured in the costemtic department of University Pharmacy, Galway — confirms that retailers are adapting to fit in with the new requirements of cost-conscious customers. Despite an ongoing recession Ireland will head European Christmas household spending this year, according to an annual survey by accounting firm Deloitte. The survey revealed that the average Irish household spend this Christmas will be €1,354, of which €688 will be spent on gifts, €422 on food and €264 on socialising, . However in a sign of increased sensitivity to value among shoppers, over 60 per cent of Irish shoppers said they would buy gifts or products that are on promotion. This is in keeping with the experiences of many Irish retailers. 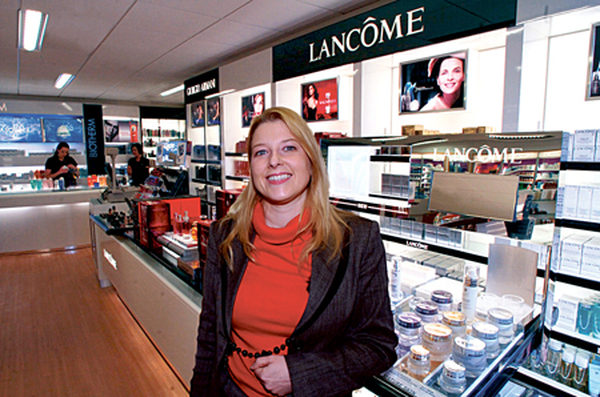 Consumers are putting a greater emphasis on value for money this year, according to the owner of Galway’s newest cosmetic department Dr Audrey Kinahan of University Late Night Pharmacy. “We are seeing very strong demand for our leading brands like Lancome, Clarins and Chanel but customers are definitely more conscious of getting better value for their spend”. According to Deloitte retailers will need to develop innovative and creative propositions that match consumers’ needs.. “In our Galway pharmacy you can instantly see a range of attractive offers. “For example shoppers can avail of a free Lancome gift bag packed with travel size products when they buy from the Lancome range. “While the new Clarins counter at the pharmacy go a step further by offering not only a free gift bag but also throwing in a choice of free Beauty Treatments like mini-facials, false lash application or Indian head massage,” she said. The Deloitte survey also reported an increase in the percentage of consumers who will plan a budget for their Christmas shopping this year and Audrey says that retail businesses like hers are adapting to fit in with the demands of the cost-conscious customers. Audrey admits that the economic climate has meant that customers are now more likely to ask the price of items before purchasing. “Because of this that the pharmacy made a conscious decision to create a non-threatening shopping environment where customers are made welcome to browse, certainly a welcome departure from the stereotypical stuffy cosmetic hall of years gone by.